"It's a Strato-Sentinel. It's one of the automated drones the Forerunners use on their artificial worlds. The Covenant originally thought them to be holy warriors of the Sacred Rings. There are many types of Sentinels that the Forerunners created—this particular one is designated as a Retriever." The Retriever Sentinel, also known as a Strato-Sentinel, is a type of Sentinel drone employed by the Forerunners. Retrievers are designed to perform terraforming projects, and are capable of mining moons, asteroids, or other planetary bodies. Considered to be one of the more powerful variants of the Sentinel, Retrievers are massive, ship-sized drones that were utilized to construct installations of the Halo Array from Installation 00, as well as to provide maintenance to the Ark itself. "Our records indicate that it employs an artificially produced gravitic force to remove minerals from a planet's surface. Those minerals in turn are used to build Forerunner structures and installations." 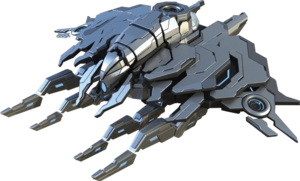 Dark gray in color, Retrievers are massive and powerful Sentinels that are slightly smaller than the average human frigate, which are about 478 meters in length. The upper section of a Retriever is vast and wide, while the lower section is lined with numerous mechanical, tentacle-like "legs" that move in pursuit of objects. Glowing eye-like lights are installed on the front of each Sentinel. When not in use, the legs remain in a closed resting position on the underside of the Retriever's hull. Nathaniel Palmer and other scientists observe Retrievers operate on the Ark. A Retriever is capable of producing an artificial gravitic force that allows it to remove materials from a world's surface. Once in position above an acceptable place to harvest, the Retriever deploys its blue, gravitic beam towards the world's surface and begins hauling chunks of land caught in the beam into its underbelly. The mining process utilized by a Retriever is noted to create a tornado-like effect as the ground is pulled into the Sentinel's hold. If deemed necessary, a Retriever is capable of connecting and merging with another Retriever and forming a single unit. Combined Retrievers somewhat resemble an average Retriever, though they seem to be more effective in combat and are significantly more maneuverable. With no apparent drawbacks, a combined Retriever seems to take on the benefits of both Retrievers' speed and weaponry. When a Retriever is threatened or attacked, these Sentinels may use their gravitic beam as a dangerous and highly destructive, though cumbersome, weapon. As the Sentinel was not designed for combat situations, Retrievers have little to no shielding. In 2555, monitor 000 Tragic Solitude outfitted thousands of Retrievers with massive energy weapons mounted on their fronts. These weapons are similar in design to the Sentinel beams employed by the smaller Aggressor Sentinels. These Retrievers were capable of utilized powerful volleys of energy against opponents and were significantly faster and had greater maneuverability in space. Once destroyed, Retrievers typically exploded into a giant fireball that engulfed its surroundings. "I thought Retrievers were just for mining and gathering minerals!" The Retrievers are among the most powerful of the Sentinels employed by the Forerunners, with their primary purpose being the mining, gathering, and transporting of minerals and other natural resources from a world. Using its artificially created gravitic force, Retrievers extract materials from a world's surface and transport to construct Forerunner structures and installations. Retrievers were also used by the Forerunners as escorts to keyships and larger Sentinel variants. The Forerunners utilized Retrievers to help in the construction of the Halo rings, such as the newly constructed Installation 08 in 2552, and the maintenance of Installation 00. The Retrievers employed at the Ark worked with Assembler Sentinels to construct new installations. Populating the Foundry, Retrievers mined and gathered raw materials from the planetoid hosted in Installation 00's center and transported them to a forge within the Foundry that refined, processed, and stabilized the materials into the mold of a Halo installation. The Assemblers would then use these resources to build components of the installations. Although usually automated, Retrievers can be controlled by a monitor. Monitors are capable of effectively utilizing Retrievers in combat, and can have them overwhelm opponents. A Retriever is programmed to complete its tasks with no deviations or hesitations. Although the function of the Retriever is primarily construction-related, the Sentinel is able to defend itself, or its installation, if necessary. However, Retrievers maneuver poorly and are unable to effectively combat modern Sangheili and human vessels alone. Thus, Aggressor and Protector Sentinels are primarily used as defensive constructs on installations. N'chala watches the construction of the portal. Retriever Sentinels were utilized by the Forerunners to aid in the construction of the Halo Array at Installation 00, with the intentions of firing the rings to wipe out the Flood. Retrievers were used as escorts during the Forerunner-Flood war. Following the firing of the Halo Array, Retrievers assisted the keyships with the reintroduction of species throughout the Milky Way, as per the Conservation Measure, accompanying the vessels back to species' homeworlds. Retrievers assisted with the excavation and construction of a massive slipspace portal on Erde-Tyrene, in the present-day country of Kenya, that had been set into motion by the Librarian before her death. These Retrievers were spotted by the human tribe elder N'chala, in the years after the reintroduction, who mistook the sentinels for gods. 000 Tragic Solitude: "My Retrievers will mine the worlds in your system and obtain for me that which I need to effect repairs." 000 Tragic Solitude: "Indeed. I have thousands at my disposal. And I will send them through the portal to do what must be done in order to repair me. I am the Ark, and I must be repaired." After the destruction of Installation 04 on September 23, 2552, Retrievers on Installation 00 began to mine the planetoid captured in the Ark's Foundry to construct a replacement installation. On December 11, 2552, these Retrievers were encountered and observed by Sangheili and United Nations Space Command forces during the Battle of Installation 00. The battle ultimately resulted in the Ark becoming heavily damaged, leading to 000 Tragic Solitude—Installation 00's now-rampant monitor—allocating all of his time and resources to the construction of thousands of heavily armed Retrievers that would mine human colonies for resources to repair the Ark, blaming humanity for damaging his installation. In March of 2555, Tragic Solitude used a captured human to initiate the activation of the Halo Array. As expected by the ancilla, the United Nations Space Command and Swords of Sanghelios reopened the Portal at Voi on Earth to reach the Ark. With the portal now open, Tragic Solitude sent a Retriever through the portal to gather Earth's resources to repair Installation 00, which sustained heavy damages in the aforementioned battle. 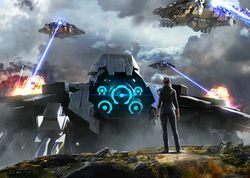 As the Retriever began to strip mine the country of Kenya, the cruiser UNSC Endeavor immediately responded by attacking the Sentinel. With the aid of several UNSC attack crafts, Endeavor was able to destroy the Retriever. As the UNSC and Sangheili team prepared to venture into the slipspace portal aboard Mayhem, another Retriever suddenly exited—this time, heavily armed. However, the Sentinel was easily outmatched by Mayhem and was destroyed. When Mayhem entered the intergalactic space around the Ark, dozens of Retrievers attacked the corvette and managed to down the ship. After the crew of Mayhem succeeded in averting the activation sequence of the Halo rings, Tragic Solitude sent his army of thousands of heavily armed Retrievers through the portal to Earth. The Retrievers exited the portal over Kenya and some proceeded to extract materials from Earth, while others immediately engaged the dozens of vessels from the UNSC Home Fleet that were awaiting outside the portal. While the Retrievers' lack of armor made them vulnerable to human fire, their vast numbers overwhelmed the Home Fleet. However, members of the crew of Mayhem fired into the data banks of Tragic Solitude and the monitor reluctantly called off the Retrievers to convince his attackers to stop. The Retrievers retreated back into the portal and returned to the Ark, upon receiving Tragic Solitude's signal. After Solitude's subsequent destruction, the thousands of Retrievers turned dormant, remaining adrift in the space around the installation without any monitor to guide them. Retrievers under the control of Ellen Anders. "When we first arrived here, the Ark had suffered great wounds from our war against the Covenant, and so we activated dormant Retriever Sentinels and deployed them to strip-mine lifeless planets for the materials needed to repair the installation. Like watching a sleeping giant nudged into wakefulness, the reconstruction slowly reached full automation until we were no longer needed to guide the Sentinels and could simply sit back and record the wonder of a world being reborn." Doctor Luther Mann theorized that the dormant Retrievers could be reactivated and utilized to repair the Ark, opening slipspace portals to strip-mine uninhabited planets for the resources and minerals required to repair the Ark. In 2557, a human research team traveled to Installation 00 aboard Eden Rising to establish a permanent base on the Ark, the Henry Lamb Research Outpost. Desiring to repair the installation, the researchers activated the dormant Retrievers, under the guide and direction of the smart AI Isabel. To gain resources, the Retrievers were deployed to strip-mine lifeless planets. Before long, the Retrievers were able to enact repairs unsupervised, leading to Isabel and the researchers setting to the task of cataloging and analyzing the installation. The Retrievers acted quickly and within months had largely restored the Ark to its former state, as well as constructing another replacement Halo installation at the Foundry. However, in October 2558, the portal to the Ark had shut down again with the Banished arriving at the installation in the following month. The human researchers were killed by the Banished, while the Retrievers sought to defend their installation from the hostile invaders who were attempting to appropriate the installation for their own purposes. In March 2559, UNSC Spirit of Fire arrived over the Ark, where the ship's crew soon came into conflict with the Banished. During the resulting battle, UNSC forces managed to access the replacement Halo installation, having it depart the Ark's Foundry. In response, heightened automated security protocols were initiated and Retrievers were deployed to repel the invaders. While Banished and UNSC forces battled on the surface of the new Halo, a Retriever attacked forces from both sides. After UNSC forces managed to damage the Sentinel, the Retriever retreated for repairs. With UNSC forces taking control of three nearby control towers, Professor Ellen Anders of Spirit of Fire soon found a way to manipulate the Ark's command codes and bypass directive locks, allowing her to take control of the Retriever. The UNSC used the Retriever to disable a nearby energy barrier, giving them access to the Halo's control room. Retriever Sentinels also played a role in guarding Forerunner starfighters. Several protected the entrance of a Forerunner starfighter hangar, attacking UNSC and Banished forces indiscriminately. Major Vaughan and the UNSC managed to destroy it, allowing them to destroy the starfighter before the Banished could launch it to destroy the UNSC Spirit of Fire. Atriox later issued orders to Pavium and Voridus to salvage material from around High Charity's crash site for their ongoing campaign against the humans, warning them not to go beyond the containment shield. Two Retriever Sentinels were dispatched to stop the Banished from reaching the crash site, but Voridus managed to shut down the Sentinel Defense Network, disabling all Sentinel operations. Ignoring Atriox's orders, Voridus breached the containment shield, releasing the Flood, which spread uncontrollably due to the Sentinels being disabled by the defense network. Once Voridus reactivated the defense network and Pavium cleared the launch sites clogged by biomass, Retriever Sentinels arrived to assist the Banished and lure the Proto-Gravemind out from its nest, effectively destroying it. Info: Summons a powerful controllable Retriever Sentinel. Super Unit and Ultimate Unit for Sentinels.. In Halo Wars 2, the Retriever Sentinel is a Super Unit for Sentinels exclusive to Professor Anders that can only be built using a leader power. Unlike the G81 Condor or Banished Scarab, there can only be one Retriever Sentinel used by the player at a time. If the player picks the Retriever Unit leader power, Anders is able to deploy two types of Super Unit (G81 Condor and Retriever Sentinel). In gameplay information, Retrievers are labelled as an Ultimate Unit. In the campaign's eleventh mission, "The Halo", Anders is able to take control of a Retriever Sentinel that initially attacks both the UNSC and the Banished. In the campaign, the Retriever is indestructible after the player manages to damage it to 25% of its HP, forcing it to retreat and repairs. During Operation: SPEARBREAKER, the Retriever Sentinel is equipped with energy shielding, and can call in Sentinel Swarms to repair itself. During the salvage operation led by Pavium and Voridus, two Retriever Sentinel are dispatched to stop Voridus' Scarab and are destroyed once Voridus shuts down the Sentinel defense network at High Charity's crash site. In an attempt to destroy a Proto-Gravemind, Pavium reactivates the Sentinel defense network and clears a Forerunner launch site, which summons a Retriever Sentinel. Retriever Sentinels were originally planned to appear in Halo 3, but were ultimately cut from the game. One of the early settings for the map "Blackout" was the interior of a damaged Retriever in orbit around the Foundry, where other Retrievers could be seen in the distance harvesting materials from the Foundry's resource moon. However, this idea was scrapped. During production, they were known as "Strato-Sentinels", a name that would later be adopted in subsequent canon. The Retrievers were also intended to be included in Halo 4, though they were removed from the game during the pre-production stages. Early concept art of the Retriever for Halo 3. Concept art of the Retriever for Halo 3. Concept art of the Strato-Sentinel in Halo 3. Concept art of the Retriever in Halo 4. Concept art of the Retriever for Halo Wars 2. A Retriever Sentinel in Halo Wars 2. A Retriever charging its fusion bolt attack. A Retriever with a swarm of Protector and Aggressor Sentinels. A Retriever and other Sentinels attack a Banished Outpost. Retriever Sentinels, Protector Sentinels, and Aggressor Sentinels prepare to attack Decimus. A Retriever Sentinel from the side.